Thankgivukkah, the first and only Thanksgiving and Hanukkah of our lifetime, is coming soon! Use this guide to prepare yourself to host guests with various health, ethical, and religious dietary restrictions. 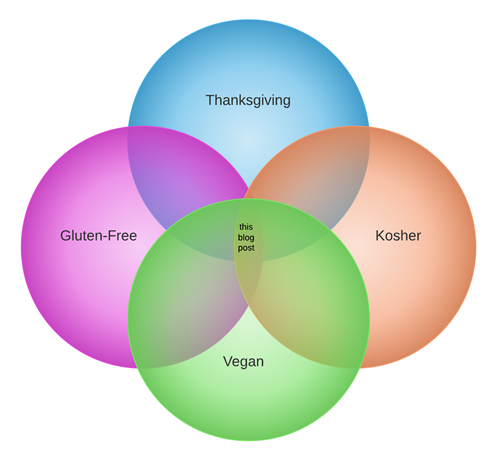 Learn the restrictions of gluten-free, vegan, and kosher diets. Enjoy a cornucopia of delicious seasonal holiday recipes that celebrate the abundance available to an intersection of all three groups. A gluten-free diet (GF diet) is a diet that excludes foods containing gluten. Gluten is a protein complex found in wheat (including kamut and spelt), barley, and rye. Oats may also sometimes contain gluten because of cross-contamination in processing. Foods made from grains and grain-like plants that do not contain harmful gluten include: corn (corn flour, corn meal, grits); rice (white, brown, basmati); amaranth; buckwheat (kasha); Montina; millet; quinoa; teff; and sorghum. All meats, eggs, dairy, vegetables, fruits, legumes (including soy), nuts, and seeds are also gluten-free in their natural, unprocessed forms. Things to be weary of are packaged and processed foods. Be careful especially when selecting seasoning mixes, sauces, marinades, and soy sauces for cooking. Also beware of pickles made with (barley) malt vinegar. Wheat is the only gluten containing grain required by law to be highlighted as an allergen on the ingredients list. Fortunately, these days lots of foods highlight that they are gluten-free as a feature on their packaging. There is even a gluten-free certification symbol issued by the NFCA. A person who "keeps Kosher" is someone who follows Jewish dietary laws. Cows, goats, sheep, poultry, and fish are among the list of kosher meats. Dairy from kosher animals is also permissible. However, meat and dairy products may not be made or consumed together, not on the same plate or even at the same meal. They also can't be stored together in the fridge. Eggs, fruits, vegetables, and grains are "parve" and can be prepared with and eaten with any type of kosher meat or dairy. Pork, rabbits, catfish, and any shellfish or insects are non-kosher. Another interesting fact: grape products made by non-Jews may not be consumed which means you'll need to find some kosher wine. You should be sensitive to cross-contamination. A kosher food that is processed or cooked together with a non-kosher food, or any derivative of a non-kosher food, becomes non-kosher. For example, food coloring derived from a shellfish and used in a red velvet cake makes the cake non-kosher. Serving ware and utensils handling kosher foods should be kept separate too. Depending on how closely your guest follows Jewish dietary restrictions, you may want to use disposable or new serving platters, utensils, dining ware to make your kosher guest feel comfortable. Vegans consume a plant-based diet consisting of vegetables, fruits, legumes, nuts, seeds, grains and foods made from these plants. Vegans don't eat any animal products: no meat (seafood and chicken are meat), no eggs, no dairy (milk, cheese, butter), and no honey or other insect products. They also don't eat foods that contain these things. So puddings, ice creams, yogurts, mayonnaise, pesto, and the like are out unless they are specifically made for vegans (without dairy and egg). Some alcoholic beverages are processed with animal products. Visit Barnivore.com to see if your wine, beer, and liquor is vegan. Ingredient labels on salad dressings, breads, and other processed foods should be read. Some vegan products have a "certified vegan" symbol on the product. Most vegans would prefer if you did not cook or serve non-vegan food on the same cookware and platters as vegan foods. Be classy and try to keep separate serving utensils too. 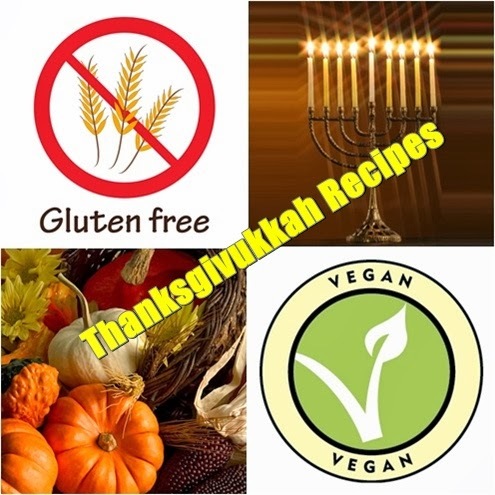 Here's a list of recipes for delicious gluten-free, vegan, and kosher dishes family & friends can share this Thanksgivukkah!